Daikon Radish is a great soup or salad vegetable. It is spicy, and acts as a digestive by stimulating digestive fire, just as the small radishes that Mexicanos eat with corn and meat do, but it is more aromatic, especially when boiled, than the small radishes and not as hot. Daikon is used in Chinese Medicine Nutritional therapy to balance heavier foods that are high in harder to digest animal protein and fat, like beef or pork. Beef and pork, which are are also neutral and cool in natural temperature, easily produce toxic dampness when eaten in excess, because the combination of heavy with cool, is even harder to break down than heavy food alone. When this heavy dampness collects in the gut repeatedly over time, eventually it spreads through the “San Jiao” triple burner system of Chinese medicine, or as “Ama” digestive toxin in Ayurveda, into the periphery, and serves as a causative factor in many kinds of diseases, from asthma and allergies, to autoimmune conditions of the gut and joints. Daikon is also an excellent vegetable for spring, due to its “decongesting” and cleansing properties. Here it is excellent combined with other decongesting and cleansing vegetables like burdock root, dandelion greens, and greens from the choy family. Since we talked about beef and pork, above, lets talk about chicken for a moment. Chicken in contrast to Pork, which is cool, and Beef which is neutral, is hot and light in nature and by comparison easy to digest, because it is lighter, so it does not need daikon. It is chicken’s hot, light nature that makes it an excellent choice when fighting or recovering from a cold or flu; not just because its easy to digest, but because its hot nature helps fight the chills, and its light energy has a lifting effect that makes you feel better, especially when combined with Astragalus/Huang Qi at the end of a cold. For this same very reason Chicken is a terrible choice for skin disorders like eczema, psoriasis and acne, because its hot nature heats the blood and its lifting energy brings that heat to the skin, the last place you want it with hot skin disease. Its for this reason chicken is often paired with bitter green vegetables or grains like Yi Yi Ren/Job’s Tears Barley which are naturally cooling and balances the natural heat of chicken. Notice that Chinese Medicine grades foods, like herbs, as hot, warm, cool, cold, or neutral, spicy, sour, salty sweet, astringent, heavy, light, drying, moistening. Chinese cooking in general, Chinese Medicine nutritional therapy in particular, and Chinese philosophy overall, seeks to balance these opposing natural elements, or Yin and Yang. Chinese medicine sees food and human life as nature in a microcosm—a series of interdependent and mutually enhancing elements—water creates moisture, fire creates heat and dryness, etc. Daikon often finds itself cooked with fresh ginger root, to further stimulate the digestive fire in the presence of heavy or greasy foods. Daikon is also considered to help prevent the development of pathological dampness in the gut such as develops when we overeat heavy moistening foods like meats and sweet tasting cooling heavy, meaty, high gluten grains like wheat. In fact, the compendium of Chinese Herbal Medicine and Foods, the Ben Cao of Dr. Li, 1578 c.e. describes daikon as both carminitive (digestive) and “corrective” which means “detoxifying.” As such it was cooked with stale or old meat, which was a necessity, given the poverty of the day. The flowers, fermented in wine, were used to produce brilliant eyes, and the seeds were also used medicinally as an expectorant, digestive, and diuretic. 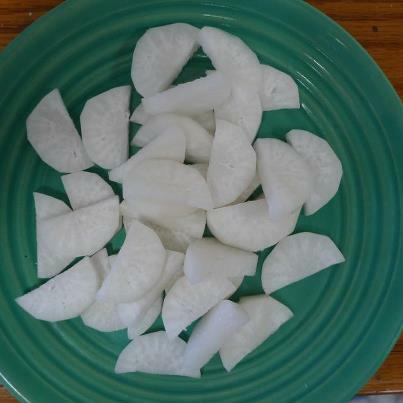 Daikon makes an excellent pickling vegetable, and is a favorite amongst Koreans, along with cabbage. The Korean beef bone marrow soup restaurant I used to go to, whose soup contained organ meats like spleen liver and lung, with a naturally building, but also toxic element, always served cabbage kimchee and pickled daikon with their soup and rice. Japanese serve raw shredded Daikon with any kind of deep fried food, for all the above reasons. Deep fried food, though warming, is also very damp producing, as it contains super-concentrated fat, and therefore a little harder to digest. Daikon, like radish, stimulated bile, which helps digest high fat. Then they often are deep frying crustacean seafood like shrimp, which are quite naturally toxic–many people are allergic to shrimp. High heat oil has a certain toxicity, too, another reason for daikon. Japanese also serve shredded raw daikon with sashimi. Again, raw fish has a certain natural toxicity, and when we take sashimi we tend to eat more fish than when we have it as sushi, hence the daikon. Of course raw fish is also cold in the stomach, so along with pickled ginger and wasabi horseradish there is daikon. In fact the Japanese love Daikon so much they even dehydrate it, which concentrates its onion-like flavor, bringing out its sweetness, too, for use in soups, especially in winter, when concentrated intense flavors are in tune with the more deep energy of the season. Kiriboshi daikon in Japanese (buy Eden brand organic Dried daikon like fresh daikon, is excellent as a base for miso soup, along with Konmbu sea vegetable and Shitake mushroom. More on Kiriboshi here. Add 1 cup daikon radish, peeled, and chopped. I like half moons. Or use 2 tbsp dried daikon. You can always just add a pinch of dried daikon to any miso soup recipe. Bring to the boil, reduce flame, simmer till the radish is cooked. Take 1-2 tablespoons mellow white miso and 1 tsp your favorite darker miso, like barley miso or red miso. Mix in small cup of water into a dilute paste. Add to your soup, stir, simmer for 2-3 minutes. Serve. Daikon is spicy, warm, and light; so Kapha can eat it “till the cows come home.” It can only benefit, or pacify Kapha, even raw. Pitta is the dosha that can aggravated/vitiated/elevated by daikon. Daikon cooked in soups is usually quite ok in moderation, and a balanced Pitta can tolerate raw daikon as a condiment when eaten appropriately, such as paired with cucumber. But someone with elevated Pitta, meaning, for example, with heat symptoms like rashes, hives, eczema, heartburn, needs to avoid fish, fried food, and raw daikon, as that is heat increasing heat. Pitta in general eats less fish and avoids fried food like the plague.